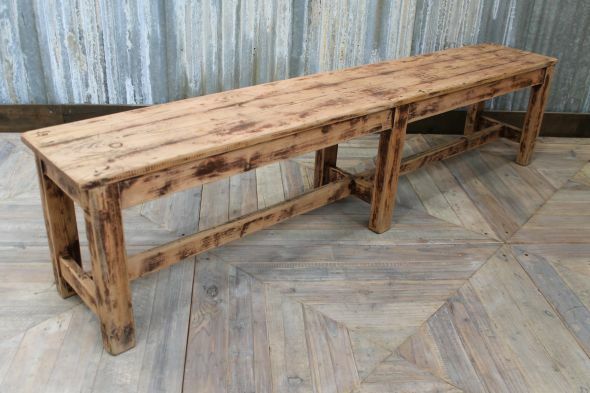 This vintage wooden bench has a rustic worn appearance, which would suit an industrial or vintage property. Just one item from our huge selection of vintage furniture, this pine farmhouse bench is a practical choice of seating for a large country kitchen or hallway. The bench could also be used in a pub, restaurant, bar or bistro – adding a rustic feel to any interior. The bench is in good condition, however, as it dates from around the 1930s / 1940s, it will have some signs of wear and tear. We feel that this only adds to the character and charm of this item.